Georgia has sustained more than a decade of optimal iodine nutrition, according to exciting new results from a national survey of school-age children and pregnant women conducted by Georgia’s National Center for Disease Control and Public Health (NCDC), with assistance from the IGN. Georgia’s success demonstrates that correctly implemented USI (i.e. providing >15 mg of iodine per kg of salt) can meet the dietary iodine needs of all population groups in both urban and rural settings. 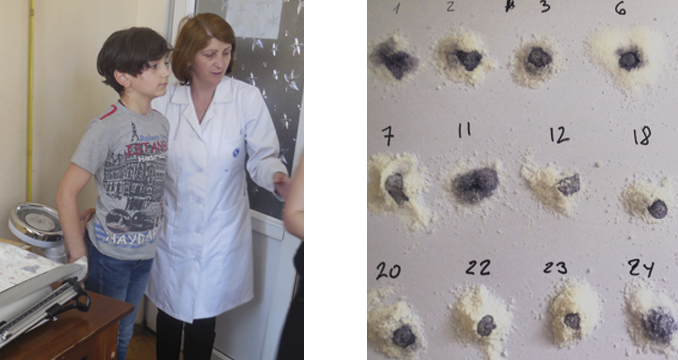 Georgia has made impressive progress to implement USI and achieve the elimination of iodine deficiency disorders (IDD) in a relatively short amount of time. By mandating salt iodization back in 2005, Georgia saw dramatic progress later that same year, with iodized salt reaching more than 90% of population. Now more than ten years later, Georgia’s USI program continues to reach 95% of the country. And importantly, iodized salt coverage is similar in urban, remote rural, and mountain regions. The 2017 survey covered school-age children (SAC) and pregnant women (PW), and in both groups iodine nutrition was optimal. This eliminates the need to prescribe iodine supplements (tablets) in both groups – something that endocrinologists and obstetricians had been doing before. "When implemented correctly, USI meets the dietary iodine needs of all population groups in both urban and rural settings." Georgia is a mountainous country with a long history of severe iodine deficiency. Prior to the recent survey, many public health experts and medical doctors could not believe that USI could be so effective in eliminating iodine deficiency. Some of them were still observing "goiters" and continued prescribing iodine tablets. The previous survey, conducted in 2006, had already reported optimal iodine intakes, but some experts warned that the situation could have changed. These latest results confirm that USI is working and has been sustained. IDD was virtually eliminated between 1955 and 1986 due to a Soviet era program that imported iodized salt from the Ukraine and Armenia. 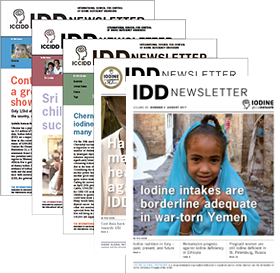 When Georgia became independent, the imports ended, and a high proportion of the population was left vulnerable to iodine deficiency: 63% of newborns had high levels of thyroid-stimulating hormone, and 80% of school-age children had urinary iodine concentrations indicating iodine deficiency. Left: A school-boy is having his height and weight measured as part of a sentinel study ahead of the national survey in Georgia. Right: Testing household salt for the presence of iodine shows that they are all iodized (dark color). USI was a joint effort by the Georgian government, UNICEF, the IGN and other international partners. The National Program for IDD Elimination is coordinated by the Georgian Parliament, and first came into formation in 1998. What really impressed me is how Georgia was able to implement and sustain extremely effective program of salt iodization by forbidding the import of non-iodized salt and giving tax breaks for iodized salt imports (slashing VAT), and also by effectively carrying out a communications campaign on the importance of iodized salt. Dr. Gregory Gerasimov graduated from Moscow Medical University before joining UNICEF as a consultant for salt iodization programs in 2000-2012. He provided expert service to over 20 countries to help them reach optimal iodine nutrition. He has served as IGN Board and Management Council member since 1993 and is currently IGN's Regional Coordinator for Eastern Europe and Central Asia.